Impex have always had a special place in their hearts for Shoji Yokouchi's Greensleeves. Standards, original tunes, and the title track are interpreted in breezy and surprising soulful ways. The guitarist is given immeasurable support by his band and guest organist Yuri Tashiro. Her playing is moody, fiery and funky: all often at the same time! Impex's vinyl reissue preserves the original's clear, pristine sound (check out the bass on Yuri's organ!) while improving surface noise and definition. This rare gem of Tee Fujii's repertoire is another entertaining listen for TBM fans from Impex Records! I am familiar, of course, with this prestige audiophile label from Japan, but only own two of their recordings: Midnight Sugar and Girl Talk. Both are famous superb recordings, and offer amazing audiophile sound and performances of top notch jazz arrangements. They have been reissued often by TBM and other companies, worldwide. That said, Greensleeves has never been reissued on LP by anyone, anywhere! Maybe Greensleeves was just too exciting, too bold, too dynamic, too melodic, too unusual to include a Hammond B3 organ, or maybe just ALL of the above! In past years, as I trolled the halls during the CES, it was not uncommon to enter an exhibitor’s room and hear stylish jazz in dynamic, crystal-clear sound. The music invariably was LPs from Japan on the Three Blind Mice label. Started by producer Takeshi Fujii in 1970, Three Blind Mice boasted a catalogue of several hundred titles. Greensleeves, with its engaging music and direct-to-disc sound, quickly became an audiophile favorite. Original pressings are highly collectible today, commanding high prices. Greensleeves was last available from Cisco Music in 1998 as a gold CD mastered by Kevin Gray, also selling now for crazy money. With this Impex reissue, Greensleeves is again available on LP at a reasonable price. 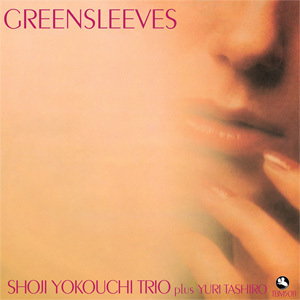 The Shoji Yokouchi Trio features its leader and namesake on various electric and acoustic guitars, Kunimitsu Inaba on string bass, and Hajime Ishimatsu on drums. For this session, recorded in early September of 1978 at Tokyo’s Epicurus Studio, Yuri Tashiro sits in on Hammond organ. The result of the two days in the studio is a recording of jazz standards and original tunes. That the performances are engaging and enthusiastic, demonstrating exceptional musicianship, makes the event all the more compelling. From the first notes of the album’s opener, "Willow Weep For Me," I knew I was in for a special listening experience, replete with uncompressed dynamics, frequency extension at both ends of the spectrum, great transparency and transient speed, freedom from overhang, precise pacing -- you name it. The tap of the stick on the cymbal was as realistic as I’ve ever heard. Ditto the "snap" on the strings of the acoustic guitar. What really got me, though, was the visceral "feel" of the Hammond organ. The deep throb of its bass pedals sent the notes in waves across the floor and up though the soles of my feet, causing much swaying. Kudos to Ms. Tashiro, for on "Moaning," I thought I was listening to the inimitable Jimmy Smith. On that same tune, the plucked notes of the string bass rang true, with the initial attack and subsequent decay of the real thing. And, as if one needed a better example of the audiophile sound, listen to the drum solo of this cut. It has it all: dynamics, speed, clarity and presence. Overall, I found the leader more convincing on acoustic guitar than on the electric, where he seemed tentative at best. I also feel, after repeated listens to the album, that his talent rests with his mastery of the guitar, not in his composing. The record itself is up to the usual standards established by Impex: dead-quiet, 180-gram vinyl pressed at RTI, cut by Chris Bellman at Bernie Grundman Mastering, and enclosed in a heavyweight sleeve. Faithful facsimiles of the original’s front and back graphics adorn the exceptionally sturdy cover stock. A heavy-duty, re-sealable dust jacket finishes the presentation. Grab this audiophile bonbon while you can. With a pressing of only 3000 copies, it won’t be around long.